Akshardham is located in the city of New Delhi near the Nizanmuddin Bridge. Akshardham means of eternal, divine abode of the supreme God, the abode of eternal values and virtues of Akshar as defined in the Vedas and Upanishads where divine bhakti, purity and peace forever pervades. Dedicated to Lord Swaminarayan, and inspired by HDH Pramukh Swami Maharaj, Akshardham is a miracle worked by the sacrifice of thousands of volunteers. The Swaminarayan Akshardham in New Delhi manily epitomises 10,000 years of Indian culture in all its breathtaking grandeur, beauty, wisdom and bliss. The temple brilliantly showcases the essence of India's ancient architecture, traditions and timeless spiritual thoughts and messages. The Akshardham Temple's experience for any one is an enlightening journey through India's glorious art, values and contributions for the progress, happiness and harmony of mankind. The temple has grand ancient-styled Swaminarayan Akshardham complex which was built in only five years through the blessings of HDH Pramukh Swami Maharaj of the Bochasanwasi Shri Akshar Purushottam Swaminarayan Sanstha (BAPS) and the colossal devotional efforts of 11,000 artisans and BAPS volunteers. The complex was inaugurated on 6 November, 2005. The making of Akshardham lies in the wish expressed by Brahmaswarup Yogiji Maharaj in 1968; the thought was "A mandir to be built on the banks of the Yamuna." The wish of Yogiji Maharaj was fulfilled through the efforts and divine blessings of his successor and present spiritual master of BAPS, HDH Pramukh Swami Maharaj. The inside of the mandir there are 8 ornately carved mandapams, each featuring the forms of Bhagwan Swaminarayan, avatars and the deities of Sanatan Dharma. The ornate external wall of the mandir is known as the Mandovar. It is the inner sanctum which lies in the 11 feet high beautiful and divine murti of Bhagwan Swaminarayan and the murtis of Guru Parampara, namely, Aksharbrahma Gunatitanand Swami, Bhagatji Maharaj, Shastriji Maharaj, Yogiji Maharaj and Pramukh Swami Maharaj; where every sincere prayer is answered. For the past 800 years, it is the only and largest intricately carved Mandovar in India with dimensions of 611ft x 31ft. It comprises of 200 sculptured stone figures of India's great rishis, sadhus, devotees, acharyas and divine incarnations. It is the beautiful bronze relief panels which illustrates the divine incidents from the life of Bhagwan Swaminarayan. It is a unique pith which captivates the feature of Swaminarayan Akshardham mandir. It mainly pays tribute to elephants, symbolizing the entire animal kingdom. Sculptured according to the ancient shilpa shastras of India it is ornately carved in pink stone, while stretching for 1,070 ft and featuring stories and legends of elephants with nature, man and God. Every panel reflects the messages of social harmony, peace and spiritual faith. The Gajendra Pith weighs 3,000 tons, has 148 full-sized elephants, 42 birds and animals, 125 human sculptures and decorative stone backdrops of trees, creepers and royal palaces. It has pure water, there lays a pilgrim place and therein the gods sport. Narayan Sarovar is a sacred water lake surrounding the main Akshardham mandir. The lake contains holy waters from 151 rivers and lakes sanctified by Bhagwan Swaminarayan, including Mansarovar. The Narayan Sarovar is surrounded by 108 gaumukhs, symbolizing 108 names of God, from which holy water issues forth. Devotees offer abhishek, a ritual of pouring water on to the murti of Neelkanth Varni, and express their reverence and prayers for spiritual upliftment and fulfillment of wishes. Today the Askhardham Temple is regarded and recognised as the Largest Hindu Temple Complex in the World which is being recorded in the Guinness World Record Committee. The Temple construction does not include the use of steel in the whole Monument. The Akshardham Temple in Delhi is one of the most recently built temples. Constructed by the Bochasanvasi Aksharpurushottam Swaminarayan Sanstha (BAPS), the temple is situated on the banks of the River Yamuna. 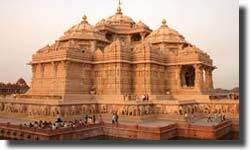 The Delhi Akshardham Mandir was inaugurated in November 2005 in the presence of President APJ. Abdul Kalam. The Temple shrine is spread over an area of 100 acres and took about two years to complete. The Temple is built in an architectural style similar to that of the Akshardham temple of Gandhinagar in Gujarat, India. The construction of the temple is based on the ancient Sthaapatya shastras of India and it is built without steel, entirely out of sandstone and marble. The main shrine of the New Delhi Akshardhaam temple consists of the statue of Lord Swaminarayan. There is also an Akshardham Temple Monument to World Peace inside the temple complex. The other deities are Shri Radha Krishna Dev, Shri Sita Ram, Shri Laxmi Narayan and Shri Uma Maheshwar. Another attraction is a restaurant modeled on the Ajanta and Ellora caves and an Ayurvedic bazaar. Combining all the cultures of Rajasthani, Orrisan, Gujarati, Mughal and Jain temple architecture, the mandir presents a magnificent sight. This temple is a major tourist attraction and counts amongst the wonders of modern India. 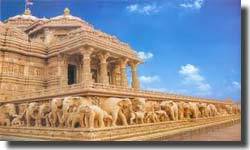 In the Temple there are approximately 234 ornate pillars, floral motifs, arches, exquisitely carved pavilions, 9 ornate domes, 20 quadrangle shikhars, a spectacular Gajendra Pith (plinth of stone elephants), which adorn this architectural wonder. There are about 20,000 statues inside Akshardham Mandir of Delhi which consists of India's great sadhus, devotees, acharyas and divine personas. Other features of the Akshardham Temple are an IMAX theatre, a Swaminarayan temple, and an elaborate musical fountain. The area around the temple building has been converted into manicured lawns with beautiful water fountains. The Temple is built in the Medieval Style of Architecture, which is made in Pink White Marbles, which has 234 Ornately Carved Pillars, 9 Ornate Domes, 20 Quadrangle Shikhars. For the first time ever in the world, one can witness the heritage of India in all its facets, insights and beauty at the Swaminarayan Akshardham through its mandir, exhibitions, verdant gardens and other attractions. The Timing of the Askhardham Temple for Dharshan is 9 AM - 9 PM (Tuesday-Sunday). Closed on Monday. Murti Darshan: 9 AM to 7 PM, Exhibitions: 9 AM to 6 PM, Musical Fountain Show: 6.45 PM, Premvati Food Court: 11 AM to 10 PM from October to March, Murti Darshan and Exhibitions close one hour earlier. If one goes by Rail transport the Askhardham mandir is about 9-10 kms from the New Delhi Railway station while if one takes an exit from platform no. 12 (Ajmeri Gate) and not platform no1. (Paharganj). Auto Rickshaws are easily available.The Akshardham Metro Station is a complement of the mandir located nearby. A metro train to the station can be easily boarded from the New Delhi Metro Station. Or even one can go from the Nizamuddin Railway Station which is about 4 kms far. Through Roadways- Delhi is well-connected by good network of roads with rest of the country as it is the Capital City of the Country. The buses are available to the temple from different places of Delhi and other nearby towns. Local Transport: For local transport DTC and State operated buses are available. Rented cars, taxis, auto-rickshaws are also available.